The article also assumes that you have an IDE in which to work, specifically a fairly recent version of Visual Studio. Well, I believe the first thing which comes in mind here is what is nodeJs and why nodeJS? Following are some of the important features that make Node.js the first choice of software architects. Asynchronous and Event Driven All APIs of Node.js library are asynchronous that is, non-blocking. 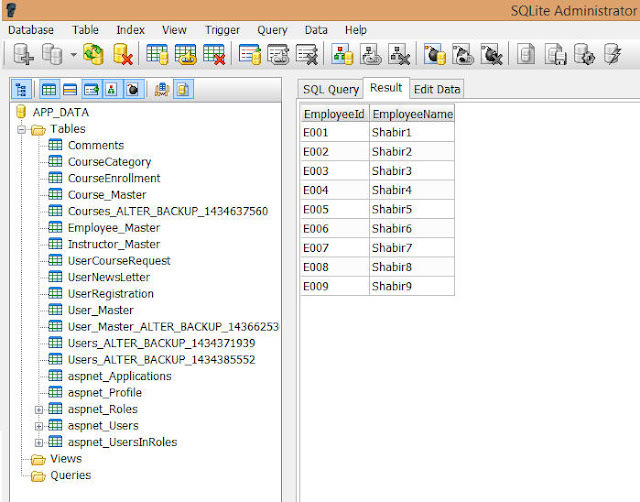 It essentially means a Node.js based server never waits for an API to return data. The server moves to the next API after calling it and a notification mechanism of Events of Node.js helps the server to get a response from the previous API call. Older NTVS releases are also available. 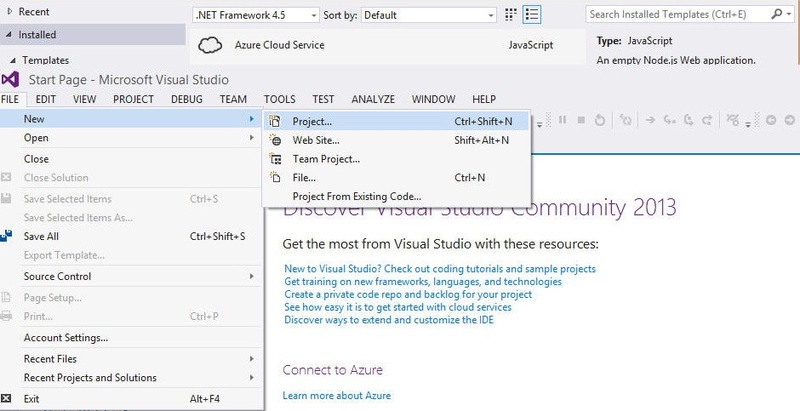 STEP3 NTVS requires a Node.js interpreter to be installed. You can use a global installation of Node.js or you can specify the path to a local interpreter in each of your Node.js projects. Node.js is built for 32-bit and 64-bit architectures. NTVS supports both. 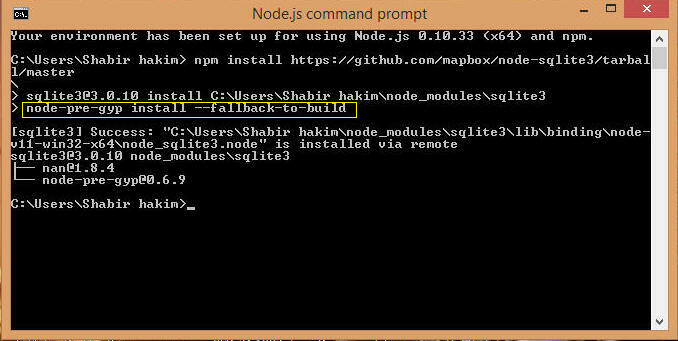 Only one is required and the Node.js installer only supports one being installed at a time. NTVS works with Node.js v0.10.20 or later. 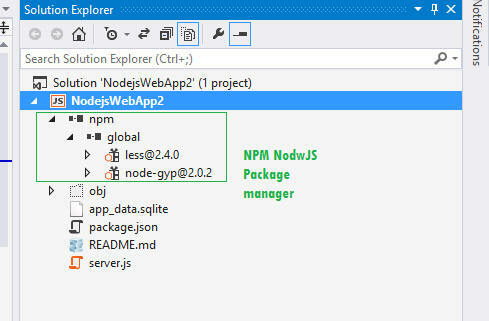 npm is the pre-installed package manager for the Node.js server platform exactly like Nget Package Manager for .Net IDE environment. It is used to install Node.js programs from the npm registry. 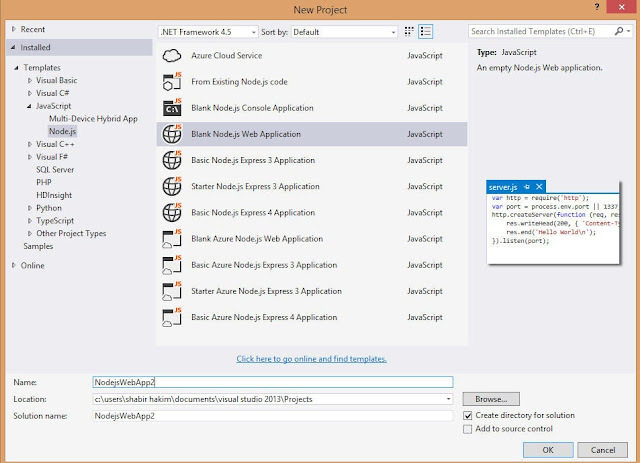 By organizing the installation and management of third-party Node.js programs, it helps developers build faster. The packages found in the npm registry can range from simple helper libraries like Underscore.js to task runners like Grunt. 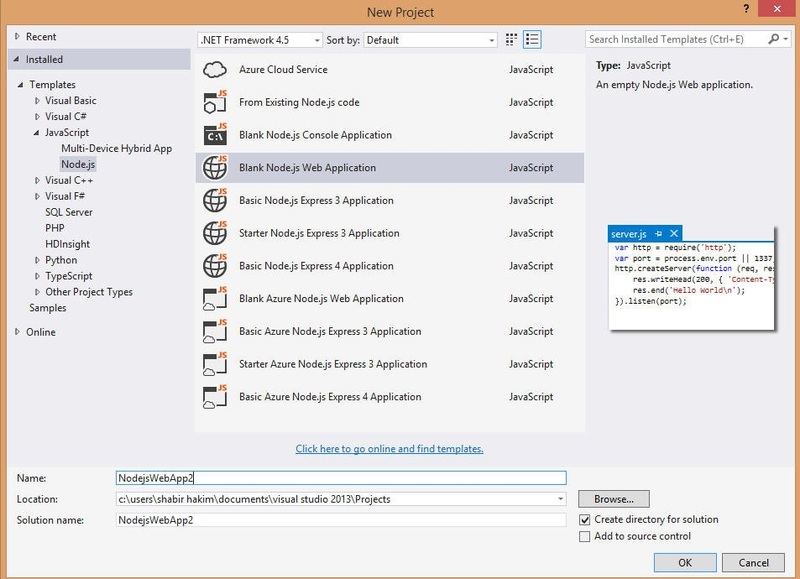 Start Visual Studio.On the File menu, click New, and then click Project like other type of projects. You can now debug your node.js web application in your preferred browser like shown below. 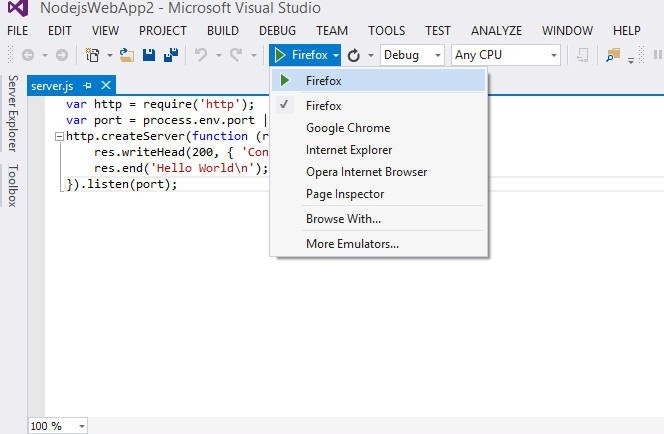 The generated code example or sample program shows you how to output "Hello World" in the browser. 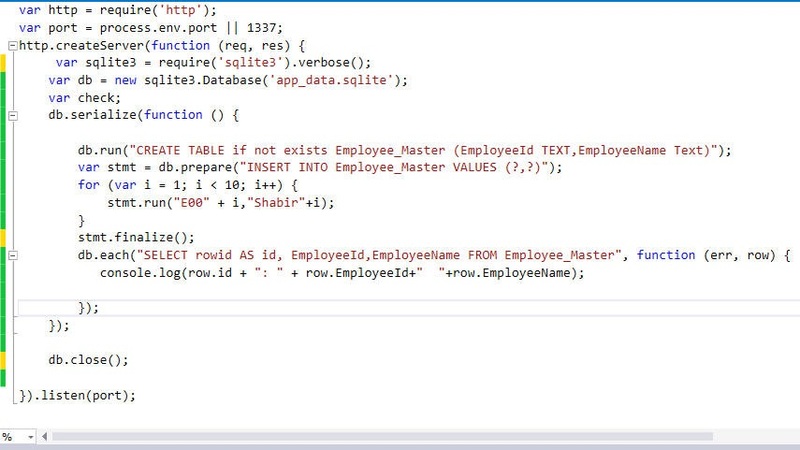 Let me explain how the generated code in server.js works line by line. Node.js has a simple module and dependencies loading system. You simply call the function "require" with the path of the file or directory containing the module you would like to load at which point a variable is returned containing all the exported functions of that module. On this line, we want to determine on which port the HTTP server serving the HTML should run. If a port number is specified in the environment variables, we will use that one or we will simply use 1337. Any HTTP response requires a status-line and headers, . In this case, we want to return 200 OK as the status response and to specify the content-type as plain text. We specify this by calling the writeHead function on the response object. Once we are done writing the response we want to call the end function. We can also pass the final content through the end function, in this case we want to send the string "Hello World" in plain text. We close off the callback and call the function listen at the port we defined earlier, this will start the server and start accepting requests sent to the defined port. To see the result, you can start debugging by pressing on the button shown in the previous screenshot. 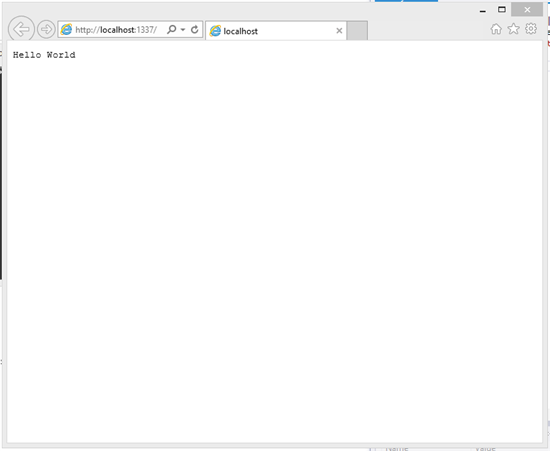 You can see "Hello World" in the browser. 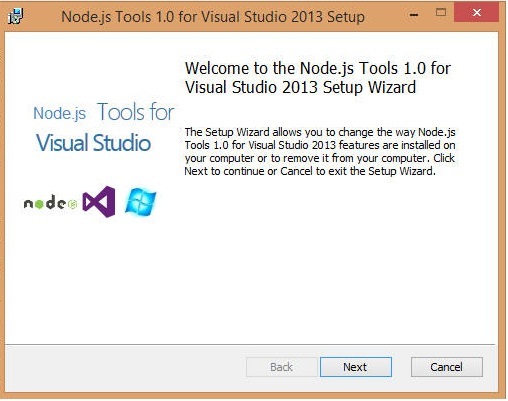 You have now successfully run a Node.js app on Windows 8.1 using Visual Studio 2013.